Campfires are an essential element to all great summers, and this year, I hit the ground running. In mid-June, the season kicked off with a trip to Acadia National Park. While my sweetheart prefers sleeping under the stars, I tend to gravitate towards luxury hotels. One night of camping followed by an evening in charming Bar Harbor was the ultimate win-win. Aside from the beautiful mountain views, the best part of camping, is of course, the food. S’mores are wonderful, but a girl cannot survive on chocolate stuffed grahams alone, especially after hours of hiking. Therefore, 99% of my vacation preparation was spent brainstorming the perfect campfire meal. The trusty cast iron skillet was a mandatory passenger on our trip, so a one-pot meal, like stir fry, quickly proved to be our winner. I opted for quinoa instead of the usual brown rice, because it is one of the quickest cooking whole grains, often requiring only 12-15 minutes of cook time. The chicken was a welcome, hearty choice after a day on the trails, but if you’re looking to keep this plant based, you can also sub tofu or shelled edamame. Get a good fire going! Add quinoa and 1 cup water to camping pot and cover. 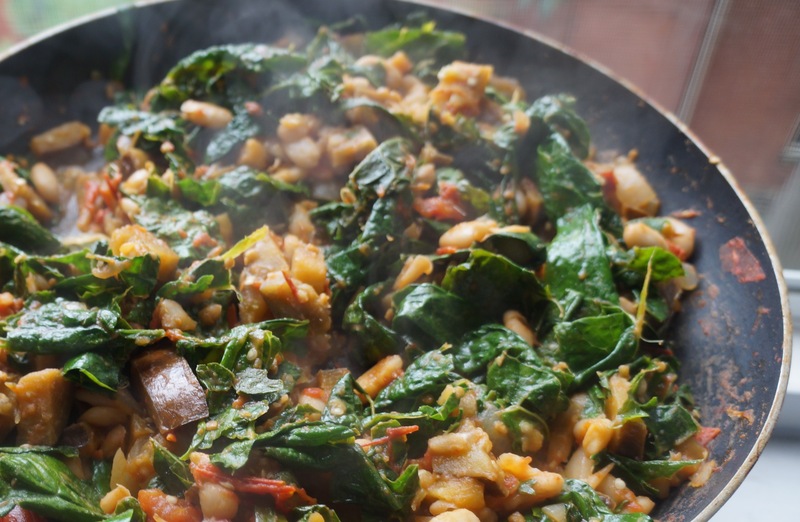 While the quinoa is cooking, warm oil in a 10-inch cast iron skillet over the fire, then add the veggies, stirring occasionally. Cut the chicken into bite sized pieces. Once the quinoa water starts bubbling, and the onions start to become translucent, add the chicken to the skillet. The quinoa needs to cook until all of the water is absorbed, and the grain sprouts a curly “tail”. When the quinoa looks like it’s almost ready, add the teriyaki sauce to the skillet, then stir well to combine. Once the quinoa is cooked, add the quinoa to the skillet, and stir to incorporate it into the teriyaki mixture. Divide the stir fry onto two plates, for serving. If there is any leftover after serving, cover the pan in foil so that it stays warm if anyone wants seconds. Best enjoyed in front of a crackling fire. 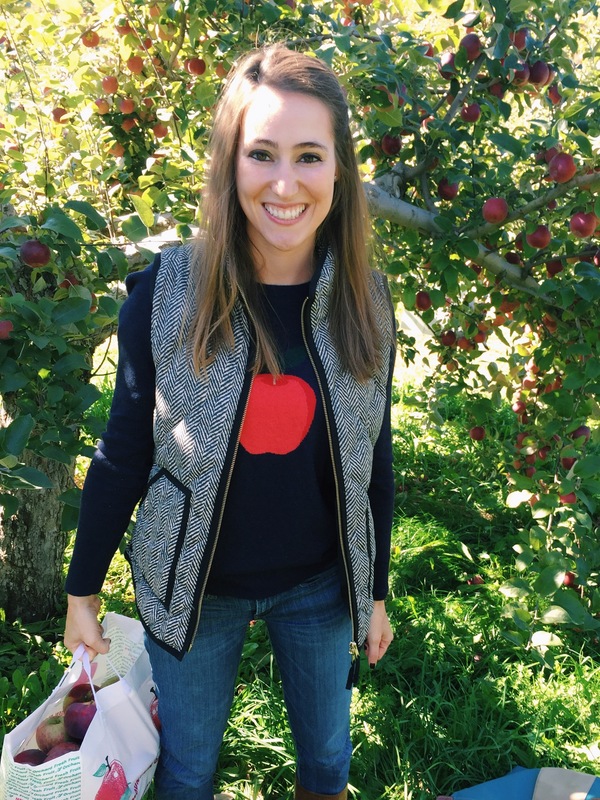 This weekend I ventured out to Vermont for an afternoon of leaf peeping and apple picking. The first stop was Green Mountain Orchards in Putney. They aren’t organic, but at least they practice IPM (integrated pest management). Next up was a late lunch in Brattleboro. 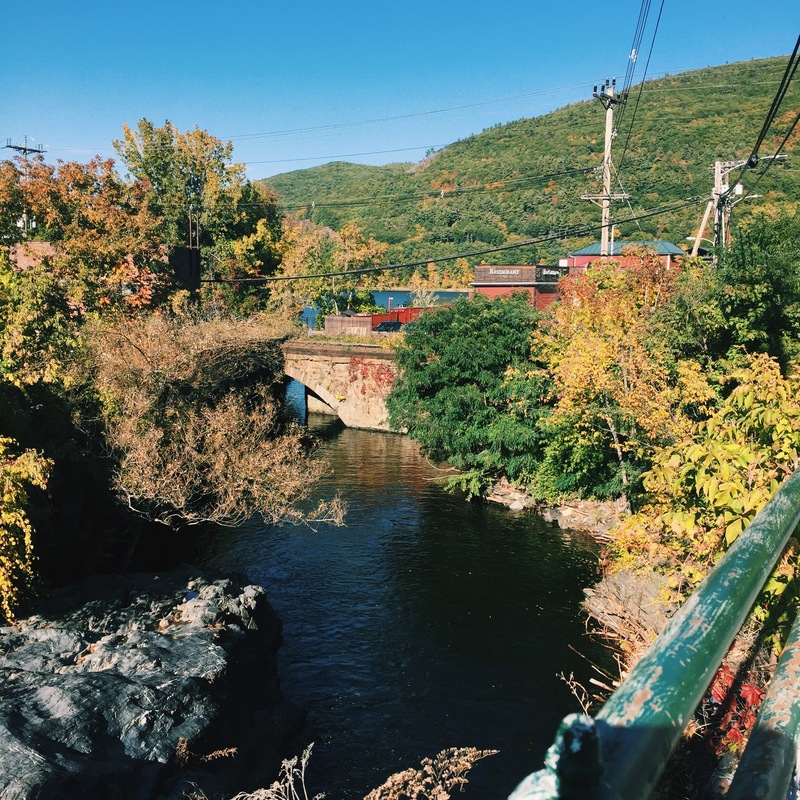 We ate at Whetstone Station Restaurant and Brewery, a fun biergarten (the red building in the photo below) that overlooks the Connecticut River. Vermont never disappoints, but the fall foliage this weekend was especially stunning. 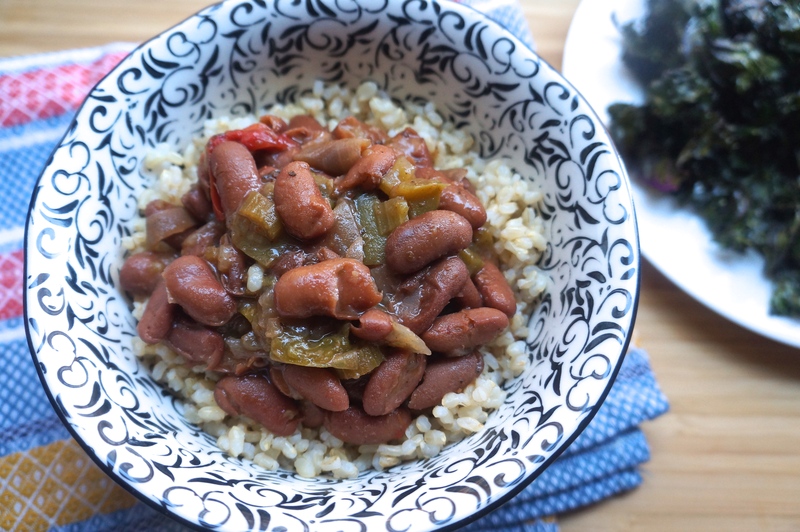 I’m always looking for ways to get more use out of my slow cooker, so this recipe was a no-brainer. Apple sauce isn’t usually a pantry staple for me, but these fragrant, stewed apples have been great to stir into my oatmeal in the mornings. For a snack, I like to stir a spoonful of natural peanut butter into my applesauce. You can also layer it with yogurt and granola, or use it to sweeten baked goods. 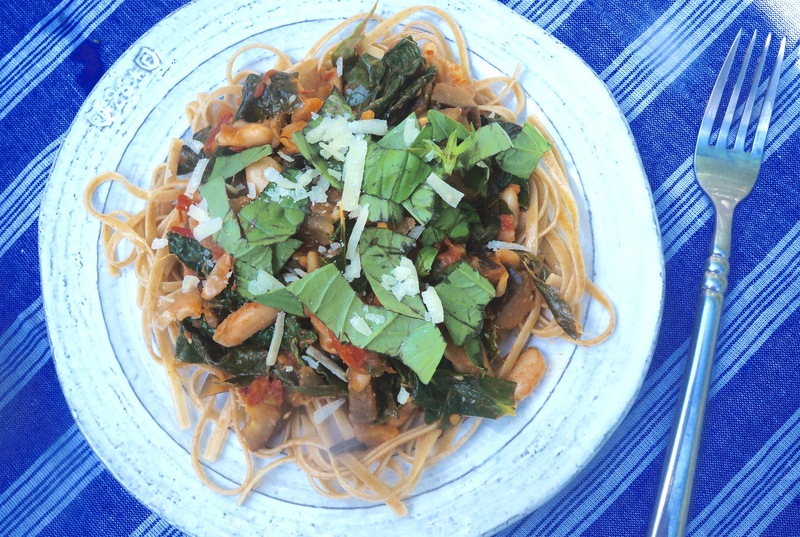 This is a great recipe that I’ve turned back to over the years. These days I don’t use nearly as much sugar as the original recipe calls for, and I tend to up the flax seed as well. 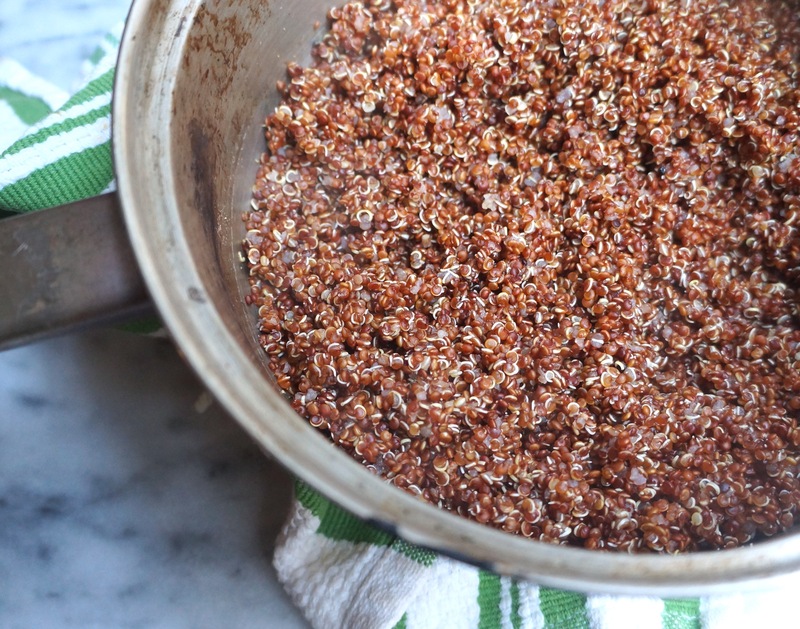 For those that haven’t tried teff (a porridge-y , African whole grain with undertones of cocoa), this recipe is a great way to familiarize yourself with a new healthy ingredient. These muffins are filled with a sweet surprise: a gooey, applesauce center. I don’t usually bake gluten free, but I love that this recipe is heavy on healthy, wholesome ingredients. Crunchy apples and tangy feta are a winning combo. For a more flavorful, nutritious twist, swap out the Israeli couscous for whole wheat couscous, bulgur or quinoa. Thanksgiving in a bowl. Need I say more? Hearty lentil soup is one of my absolute favorite foods, so I’m dying to try this apple and parsnip studded stew. While some of my friends and family will undoubtedly be turned off the idea of a veggie loaf, this nutty lentil loaf looks deliciously hearty to me. They’ll come around to meatless mains soon enough! I am on a huge tahini kick lately, so this autumn squash bowl is calling my name. For those that haven’t experimented with tahini (outside of its supporting role in hummus) prepare to be amazed. I love that this recipe incorporates rich winter squash into the classic apple crisp, for a welcome boost in both flavor and nutrition. 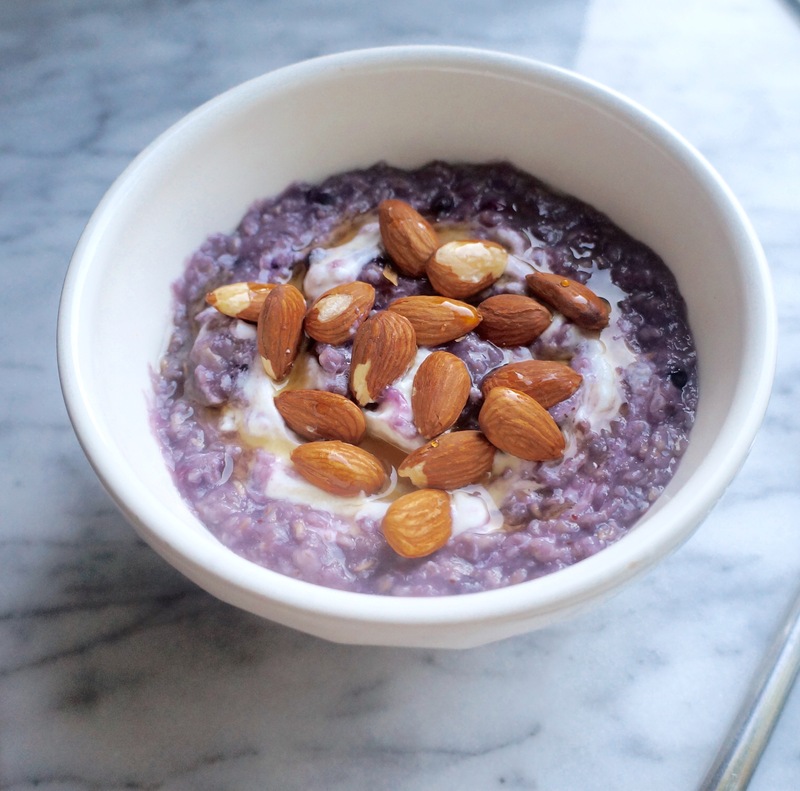 Blueberries, oats, Greek yogurt, almonds… the gang’s all here! 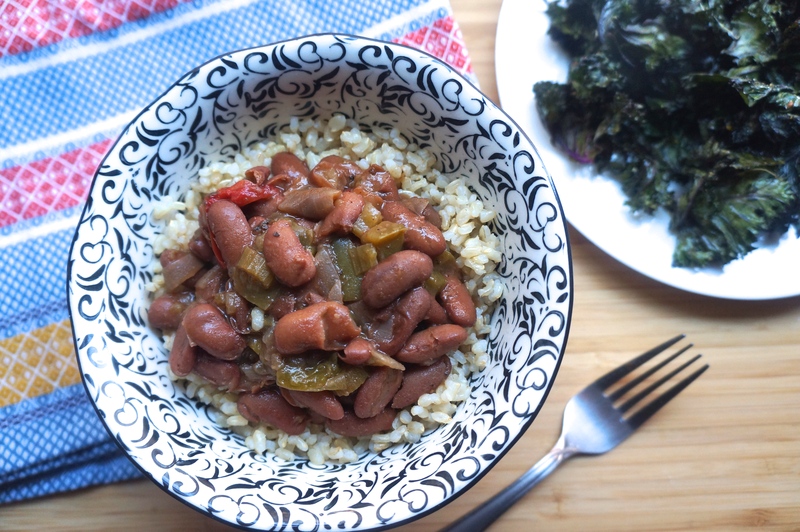 These are basically all of the go-to “superfoods” in a dietitian’s arsenal, so naturally I had to combine them into one recipe. Instead of my usual splash of milk, thick and creamy Greek yogurt offers more protein and probiotics, and helps keep you full. I usually hesitate to add refined sweeteners to porridge, but the scant ½ teaspoon of maple syrup here (yes, I got out the measuring spoons) is just the right touch of sweetness to tie the ingredients together. This is a prime example of “everything in moderation.” I don’t necessarily say no to sugar, but I insist that it be used with care. 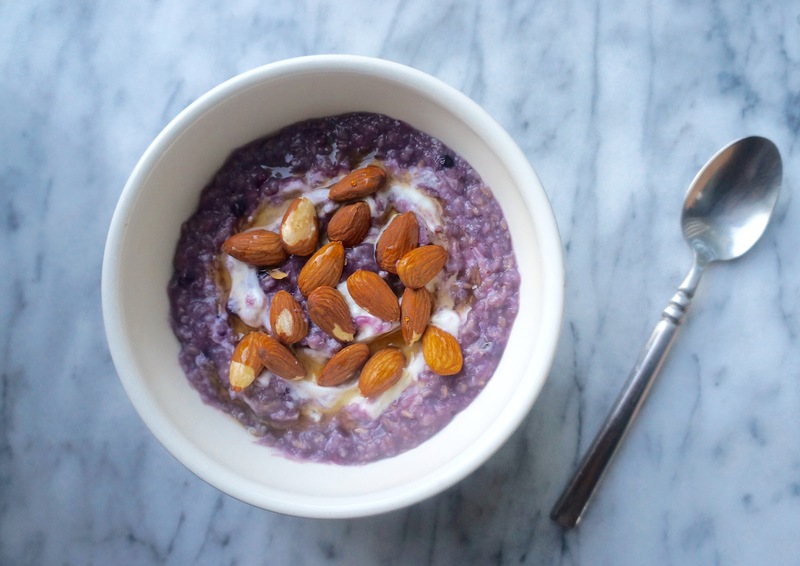 This recipe was inspired by my mom, who always cooks her oats with a large handful of frozen blueberries. We’re obsessed with these particular oats from Bob’s Red Mill, so she sent me home with a large package the last time I was in Houston. The texture is what makes this Scottish oatmeal unique; it’s somewhere between steel cut oatmeal and cream of wheat. But just like my tried-and-true rolled oats, this creamy breakfast is microwave friendly and ready in a flash. 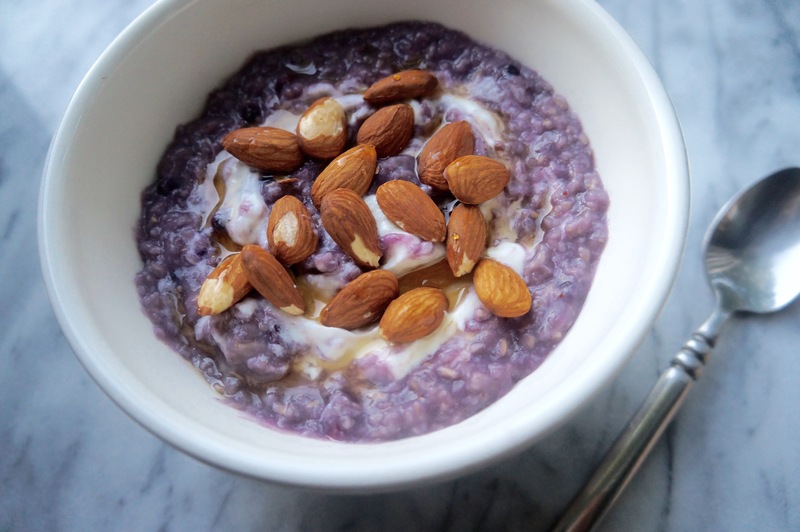 Plus, if you do it my way, you end up with purple oatmeal. How’s that for a Monday morning? Let the oatmeal sit in the microwave for one minute (this is the hardest part). Then, transfer oatmeal to a serving bowl if desired. Stir in the Greek yogurt, drizzle the top of the oatmeal with a scant 1/2 teaspoon of maple syrup, then top with almonds and serve. As promised, I put my hand-picked blueberries to good use. While my head said “whole grain muffins” and “fruit salad,” my heart said “pizza.” Heart, I think you were on to something. 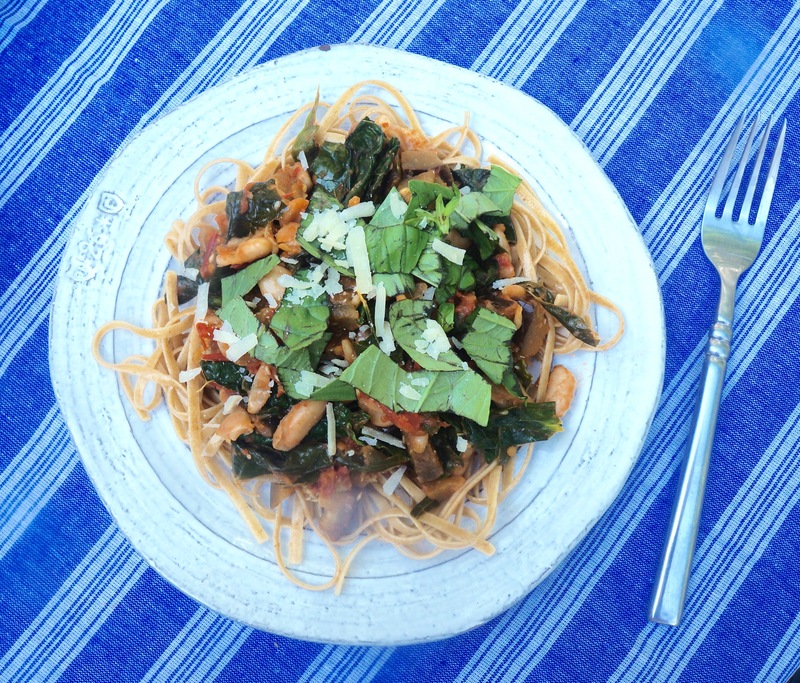 I shared this recipe on the Oldways Table Blog, so to view the full recipe, head on over to my post. 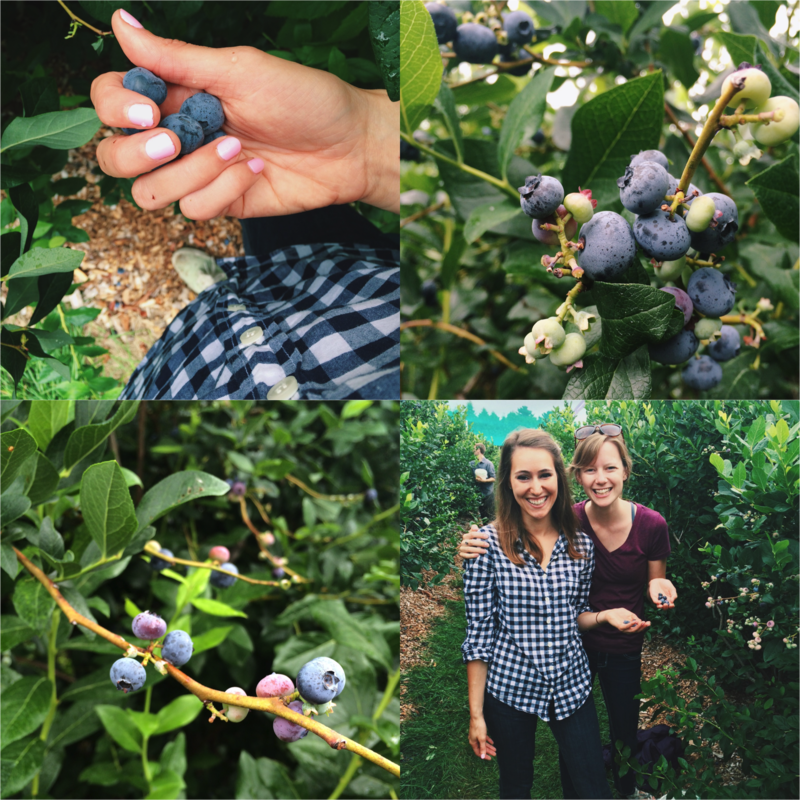 Gloomy (and thankfully, exaggerated) forecast aside, I started my Sunday with a blueberry picking double date to Parlee Farms, about an hour north of Boston near the New Hampshire Border. The pick-your-own prices were reasonable ($3.99 per pound), which means I now have three pounds of fresh picked, local blueberries to work through (kid stuff compared to Ashley and Josh’s ten-pound haul). ^^ Healthy Blueberry Zucchini Muffins from Ambitious Kitchen // I love that this recipe works in whole wheat flour, zucchini (another abundant summer ingredient), and applesauce. ^^ Turmeric Breakfast Muffins from Green Kitchen Stories // I’ve been dying to try this recipe for months now. These muffins are gluten-free (not what I usually lean towards), but luckily I have whole grain buckwheat flour (and plenty of blueberries!) on hand. ^^ Peach Blueberry Oatmeal from The Oatmeal Artist // So simple, yet so delicious. I had a similar dish (“slow cooked oats with chefs topping”) at The Willow Rest in Gloucester, MA a few weeks ago, and have been craving this combo ever since. ^^ Baked Blueberry Oatmeal from Nutmeg Nanny // This oatmeal bake is a tried-and-true recipe in my kitchen. (I’ve featured it here and here). ^^ Blueberry + Avocado Detox Smoothie from Jillianastasia // When in doubt, throw your berries in a smoothie! 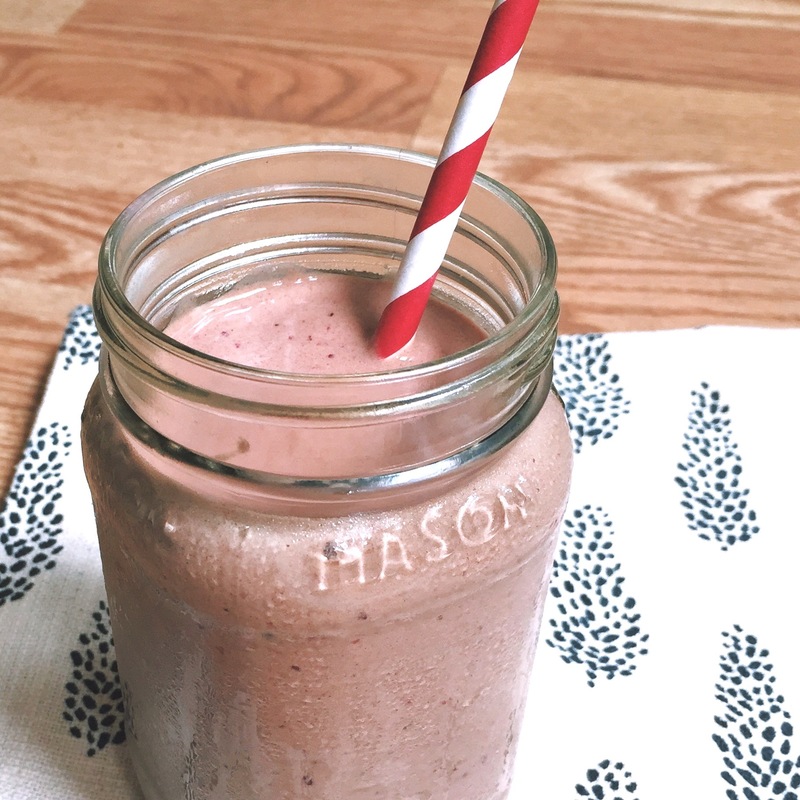 ^^ Berry Zinger Smoothie from The Crunchy Radish // Lemon and ginger can elevate a common berry smoothie into something special. ^^ Brain Power Salad (Spinach Salad with Salmon, Avocado, and Blueberries) from Gimme Some Oven // Salmon and avocado pair wonderfully with nearly any fruit, but antioxidant filled blueberries keep this “brain food” recipe on theme. ^^ Grilled Chicken Salad with Feta, Fresh Corn, and Blueberries from The Pioneer Woman // It’s not often that I link to a Pioneer Woman recipe on this site, but the grilled chicken and fresh summer produce are a refreshingly nutritious foundation. 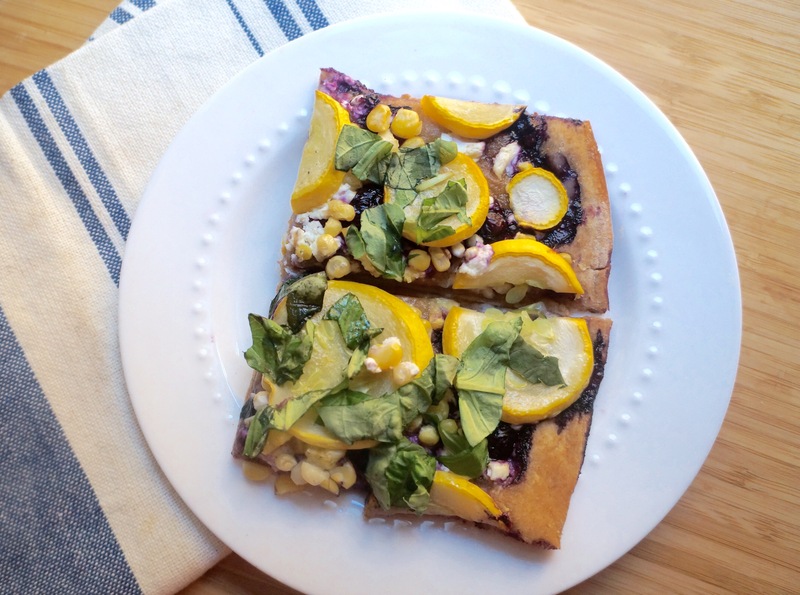 ^^ Blueberry Pizza with Honeyed Goat Cheese and Proscuitto from In Sock Monkey Slippers // I will definitely be using blueberries on a flatbread pizza this week. 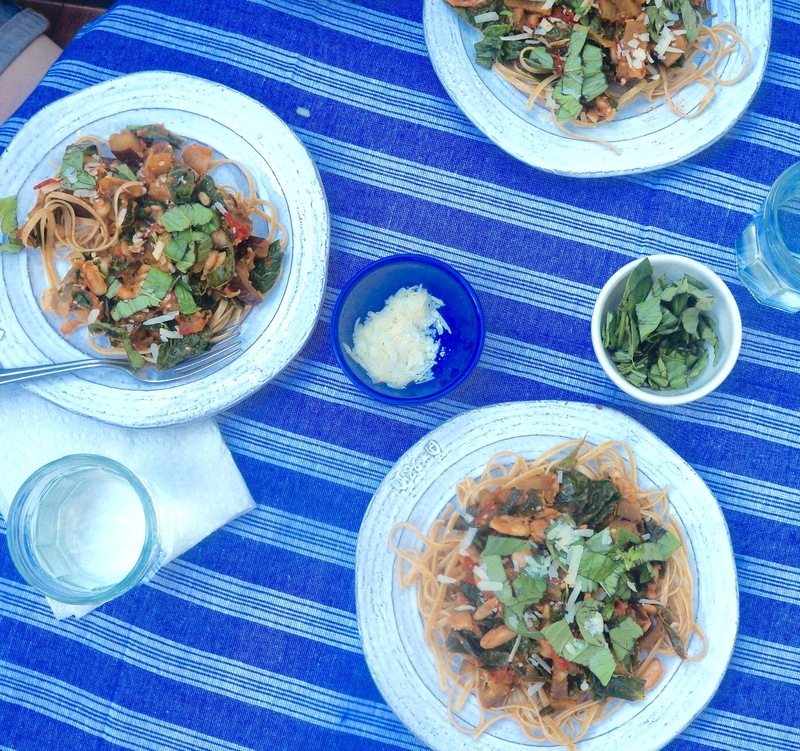 If things go well, you might even have a recipe post coming your way! ^^ Lightly Sweetened Greek Yogurt Cheesecake from Kelly Toups // I couldn’t end this list without sharing a recipe from my own collection! What’s your go-to blueberry recipe? 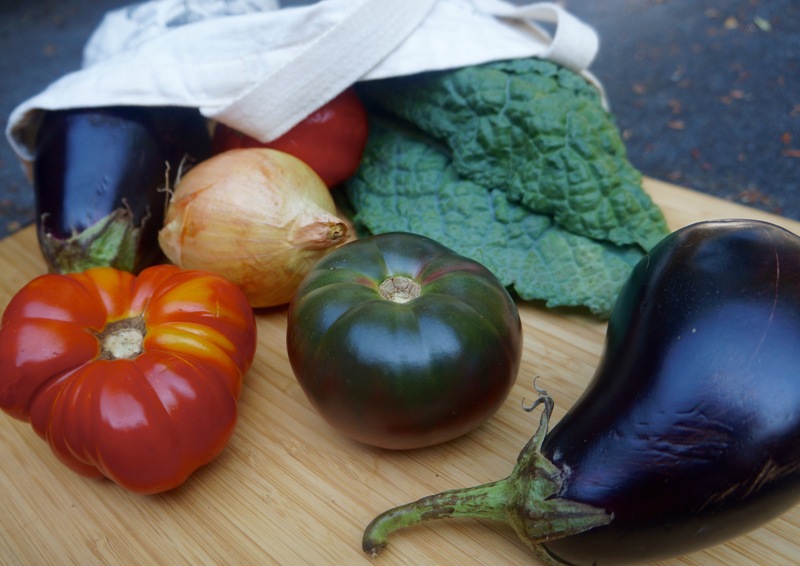 Like any self-respecting locavore, I aim to feature seasonal farmers market produce whenever possible. But alas, my penny-pinching food budget has the final say, which is why I tend to avoid picking up groceries until every scrap of food in the cupboard has been eaten. That brings me to this chocolate cranberry milkshake. 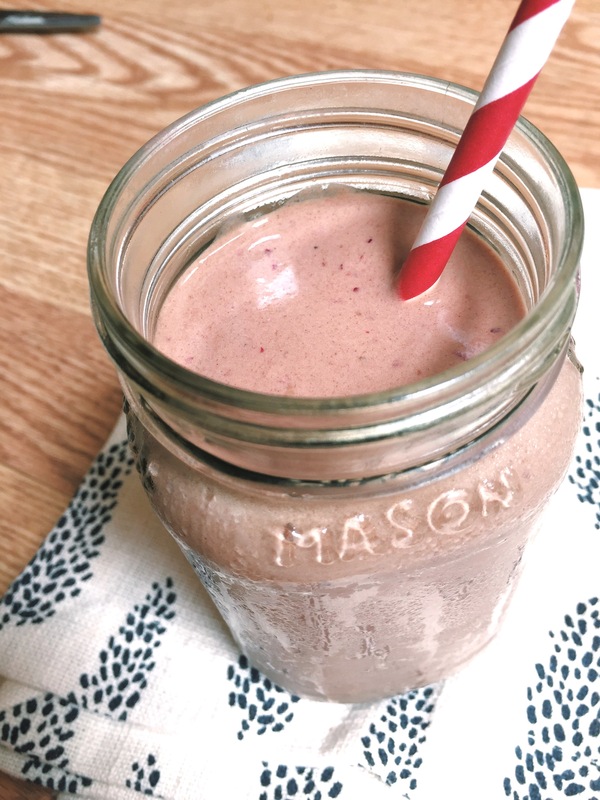 More indulgent than fresh fruit, but more nourishing than a chocolate milkshake, this cocoa-cranberry beverage is the perfect balance of nutritious and delicious. Cranberries may not be popular this time of year, but if they’re in my freezer, they’re fair game. Eating healthy need not be expensive; so if you’re out of fresh fruit, don’t hesitate to use up what you have on hand (frozen fruit, dried fruit, or fruit canned in water or juice). 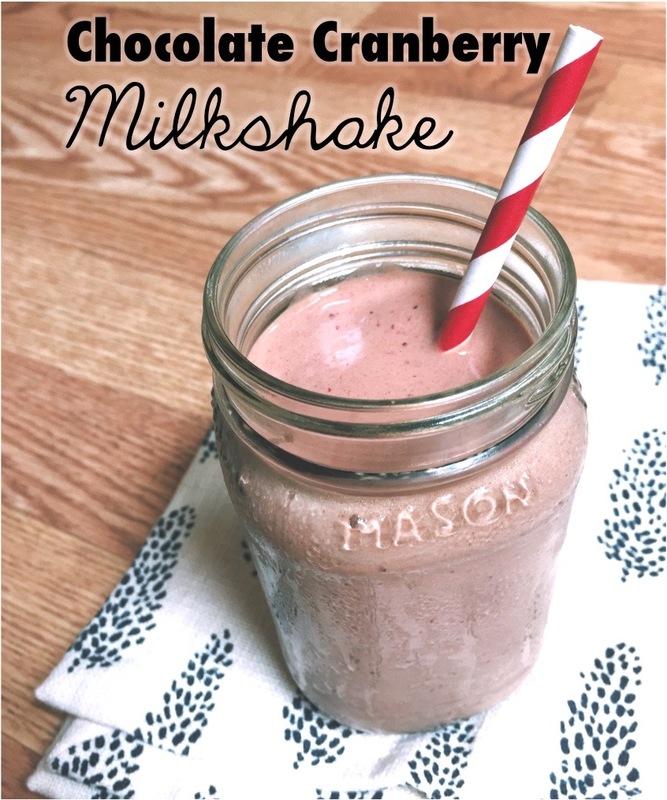 Par for the course with my other milkshake recipes, this one is sweetened with fruit alone, meaning you don’t have to worry about nutrient-empty added sugars. Method: Add all ingredients to blender, and blend to combine. Move over, baklava! Sugar-kissed nuts and cinnamon have found a new home. 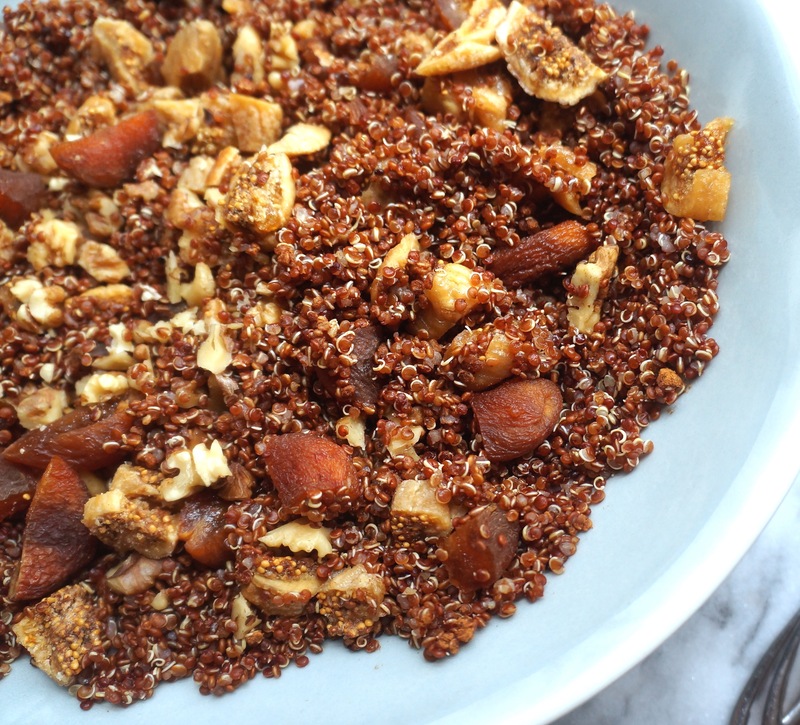 In this Mediterranean-inspired quinoa recipe, I let dried fruit and cinnamon contribute all of the sweet taste — no added sugars needed. 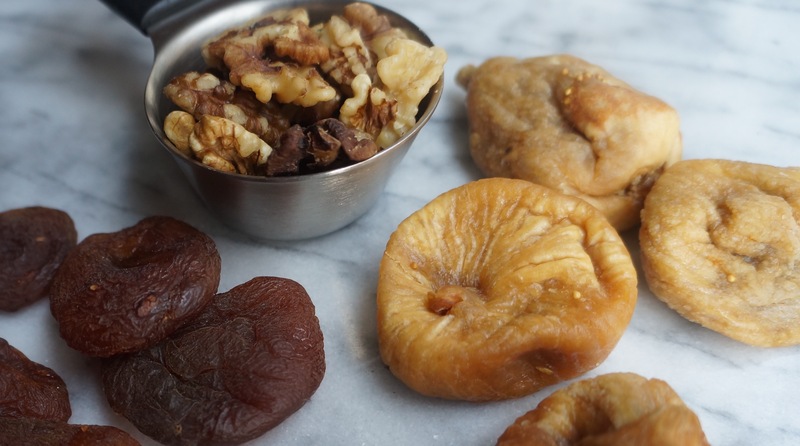 Dried figs are startlingly sugary, and when joined with Turkish apricots, raw walnuts, and cinnamon, this breakfast cereal is given a decidedly Mediterranean flair. Oatmeal is usually my go-to breakfast grain, but warm summer mornings call for cold cereal, and this quinoa fits the bill. While the quinoa is simmering, chop the figs, apricots, and walnuts into small, bite-sized pieces. Add the chopped fruit and nuts and cinnamon to a large bowl. 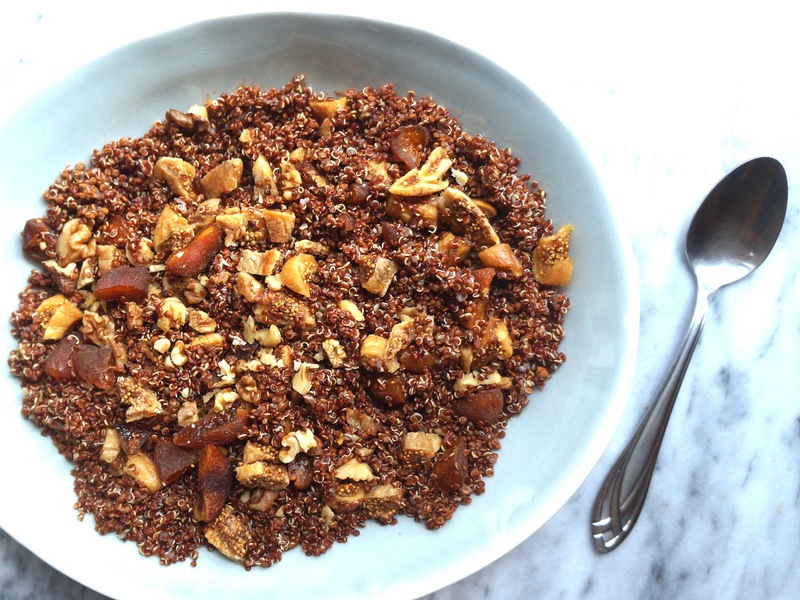 When the quinoa is done cooking, add to the bowl and toss with the fruit and nut mixture until combined. How to serve: Divide the quinoa mixture among 4 mason jars, and add ½ milk to each jar. Cover and refrigerate overnight. (This allows the fruit to soften a bit, and also allows the flavors to mingle more freely.) Alternatively, you can also keep the quinoa mixture in a covered container in the fridge. Then, when you’re ready to eat, simply scoop about 1 cup quinoa mixture into a bowl, top with ½ cup milk, and eat like regular cold cereal. One of my recent work projects has involved gathering healthy dessert recipes, so I’ve been immersed in a world of cookbooks that feature fruits, nuts, and whole grains in any manner of clever combinations. (Tough job, but somebody has to do it ;)) While combing through these creations, I was inspired to get a little more creative with dessert than my ritual dark chocolate squares, and try my hand at a healthy, protein-packed cheesecake. 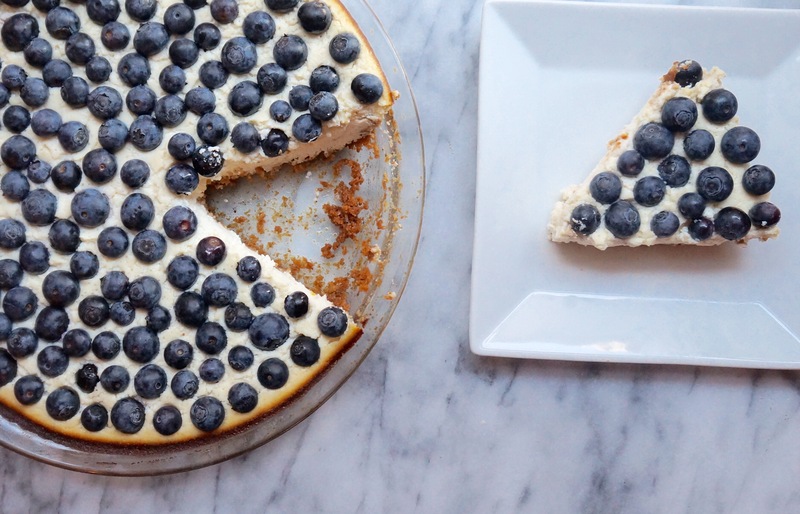 Greek yogurt cheesecake might seem like a contemporary twist, but this dessert is actually adapted from a recipe that is over 40 years old. Indeed, one of my heroes (and former employers), Frances Moore Lappé, published her recipe for “The Thinking Person’s Cheesecake” in her seminal 1971 classic, Diet for a Small Planet (albeit, with regular yogurt, not Greek). My version stays pretty true to the original, resulting in a treat that’s both delectable and refreshing. A stark contrast to the rich, cumbrous cheesecakes served at chain restaurants across the nation, the texture of this confection is airy and light (a good indicator of how you’re going to feel afterwards). But do be warned… when I say “lightly sweetened,” I mean it! Unlike the granola-laced crust, the sweetening in the actual cheesecake is very subtle (teetering towards undetectable), letting the fresh fruit topping shine against the creamy, tangy backdrop. That being said, for those looking to loosen their dependency on added sugars, I highly recommend that you give the recipe a try as written. Organic blueberries were on sale when I made this, but any fruit will do. And don’t hesitate to load it on – the fruit contributes a welcome, sugary zing. 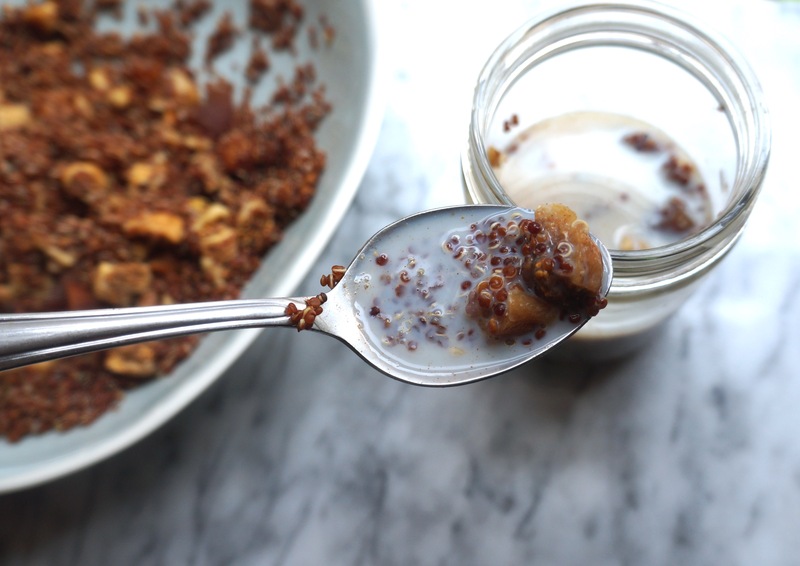 Add granola, walnuts, and ginger to food processor, and pulse into crumbs. Then add the water, and continue pulsing, until ingredients are combined. Evenly press the mixture into a 9-inch pie pan to form a crust, and bake for 10 minutes. While crust is pre-baking, prepare the filling. Add all filling ingredients except blueberries to a large bowl, and mix until combined. When crust is done pre-baking, remove from oven and evenly pour the filling into the crust. Put the cheesecake in the oven and bake for about 30-35 minutes, until center is firm. 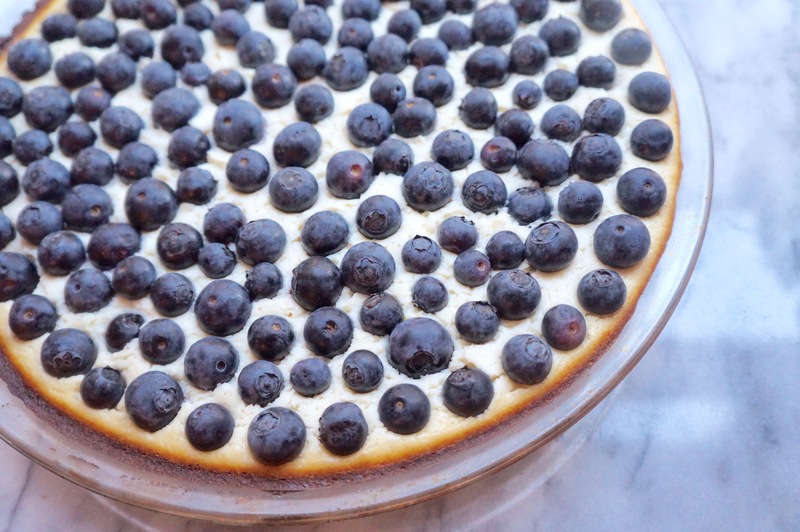 Immediately after removing the cheesecake from the oven, top the cheesecake with blueberries, pressing them gently onto the top of the cake. A note on nutrition: I based the nutrition data on 8 standard-sized slices, because I know very few people that would only eat 1/12 of a cheesecake this size. For fewer calories, feel free to serve the cheesecake in smaller portions. For example, if the pie was cut into 10 slices, (instead of 8), each slice would have about 240 calories. If cut into 12 slices, each slice would only have about 200 calories.